As an eye injury attorney in California, I know that injuries affecting eyesight can be some of the most debilitating bodily harm a person can suffer. It goes without saying that your vision is important to you, but many people do tend to take their vision for granted. If you were to take one part of one day and try to do all of your normal activities blindfolded, then you could develop a better respect for taking care of your sight. When your sight is impaired by someone else’s negligence, then you need to learn how to protect your rights by having someone fight for the compensation you deserve. When you scratch the surface of your eyeball, the initial reaction is to rub the affected area in response. 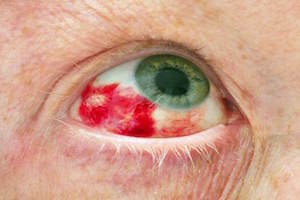 If you do not get medical help immediately, then that infection could cause blurred vision or even blindness. Foreign objects penetrating your cornea, or caustic substances being splashed into your eyeball area, can also cause irreparable damage. You could lose your sight and find yourself having to readjust your entire life. The prospects can be intimidating and the results can be devastating. Damage to the bones that hold the eyeball in place can significantly affect your vision and could cause partial loss of vision. If someone throws a baseball at you without you knowing and it makes contact with the area around your eyeball, then you could be looking at serious damage. One of the more dangerous types of vision injuries is having caustic chemicals or other dangerous materials splashed onto your eyeballs. Even if this material is washed out immediately, you could be looking and partial loss of vision, or there could be permanent blindness. If these or similar wrongful actions of others cause you to have vision issues or experience total blindness, then you need to consider talking to an attorney immediately. According to WebMD.com, the impact of a car accident on your sight could be considerably reduced if you wear seat belts. In a study of 47 car accidents where airbags were deployed, 14 of the people who did not wear seat belts lost their vision, while none of the people wearing seat belts went blind. It is easy to see how a faulty seat belt or an improperly maintained vehicle puts the odds against you. In an instance such as this, there are several factors at work that could determine negligence and fault. Were the seat belts you were wearing faulty? Was the driver operating the vehicle in a dangerous manner? If you are in an auto accident that claims your vision, then you need to understand your rights and you need to hire a professional to protect those rights. If you feel that your partial or complete loss of vision has been the result of someone else’s negligence or wrongdoing, then do not hesitate to call an attorney immediately. Your life will change permanently in a situation like this and you need someone who can protect your future by getting you the compensation you deserve. The longer you wait to call a lawyer, the more difficult it will be to secure your future. No one wants to think about the possibility of losing their sight, but it is something that could happen at any time. If you find yourself the victim of someone else’s negligence, then contact a personal injury lawyer right away and make sure that your interests are protected. Steven M. Sweat, APC has been representing people throughout California including San Diego, Los Angeles, Orange County and the Inland Empire who have suffered eye injury due to negligence or wrongdoing of another for twenty years. Call us today for a free consultation: Toll Free statewide in CA: 866-966-5240 or in the Los Angeles area: 323-944-0993.